Head Trips and World Travel – with Jennifer Batten is part of a mini documentary series that explores the mental states, struggles, and insights of taking a creative path in life. 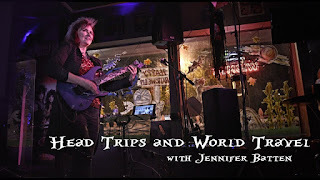 This film features instrumental rock guitar virtuoso Jennifer Batten, sharing perceptions and insights from her prolific and successful 30 plus years in music. So much of our culture seems intent on trying to divide us, and people (especially young people) are becoming more isolated and discouraged as a result. As a film maker I see this as an opportunity to explore our similarities, which for me centers on consciousness (our internal processing of experience), creativity, and the struggle to find our true path in life. I'm reaching out to experienced self made artists who have an interest in sharing the stories of their "inner voyage" and the challenges of living a creative life. As patterns emerge among a variety of artists and performers, it's my hope that viewers might gain some sense of comfort and connection from these conversations. Jennifer Batten is an American guitarist, session musician, and solo artist. From 1987 to 1997 she played in all three of Michael Jackson's world tours, and from 1999 to 2001 she toured and recorded with Jeff Beck.